This is a cake mix recipe. I've had my Gram's coconut cake for years and it's wonderful but takes a lot more effort that this quicker version. And the outcome is just as delish! Preheat oven to 350•F. Grease and flour two 9" round cake pans or a 9 x 13" cake pan. Combine cake mix, pudding mix, eggs, water, and oil in a large mixing bowl. Beat at low speed with an electric mixer until moistened. Beat at medium speed for two minutes. Sir in ⅓ C coconut. Divide into round pans or pour into 1 rectangular pan. Bake at 350•F for about 35 minutes or until a toothpick inserted in the center comes out clean. Cool. 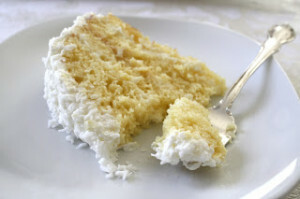 Mix frosting and coconut, reserving a few sprinkles of coconut. Spread frosting evenly over the layer(s). Sprinkle with remaining coconut. Refrigerate until ready to serve.